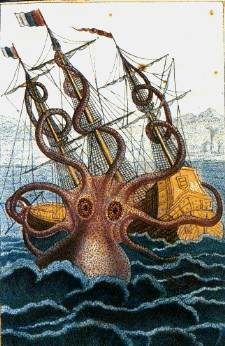 According to Wikipedia the Kraken is "a legendary sea monster of giant proportions". 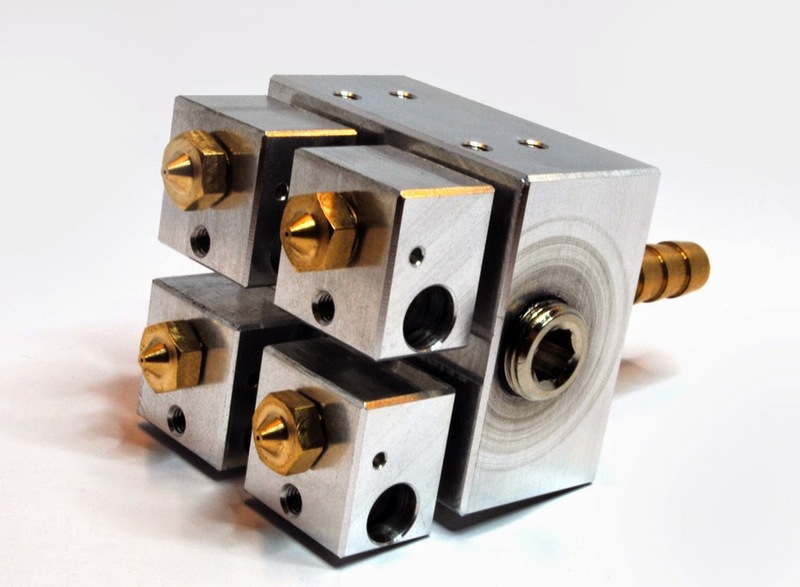 It is also a new hotend from E3D which has 4 nozzles and is water cooled - packing all that into a form size of modest proportions. I have been experimenting with the Kraken printing on the Lasercut Mendel90 using the Duet and Duex4 which supports up to 5 extruders. I was lucky enough to get my hands on one of the Krakens while still in beta (thanks Sanjay!) so there may be one or two modifications between the one I have and the final version they are bringing out soon. Re-designed X Carriage to accommodate the Kraken. The carriage itself has been modified to fit the kraken underneath, secured with 4 M3 fasteners. There is a cutout for the Bowden and water pipes and two more cutouts for the wiring. 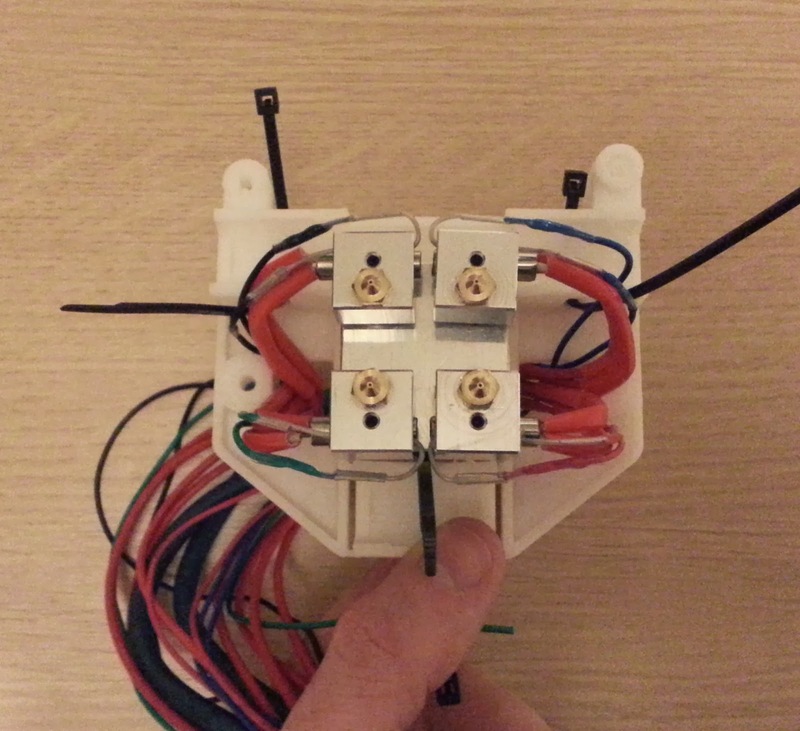 I wanted to keep using the extruder wiring loom that the Mendel90 is designed with. This normally plugs into a bracket on the extruder motor on a non-Bowden system, so I had to design a carriage mounted bracket. 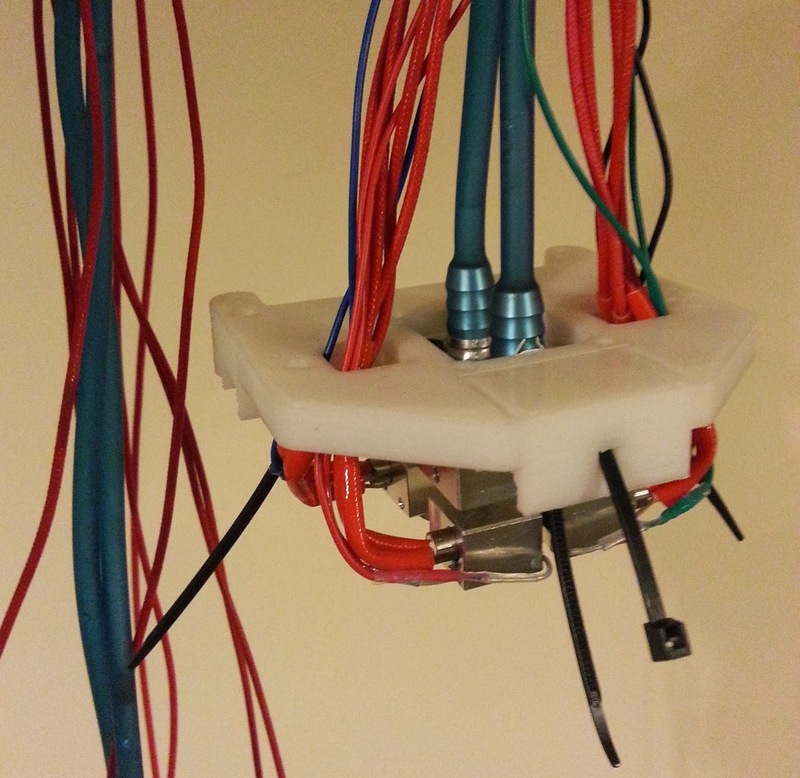 This allows for two of Nophead's 15 Way D Type extruder breakout boards to be mounted. The bracket is a bit of a pain to print as it needs support but I like the way it all fits together. This picture shows it part way through assembly. 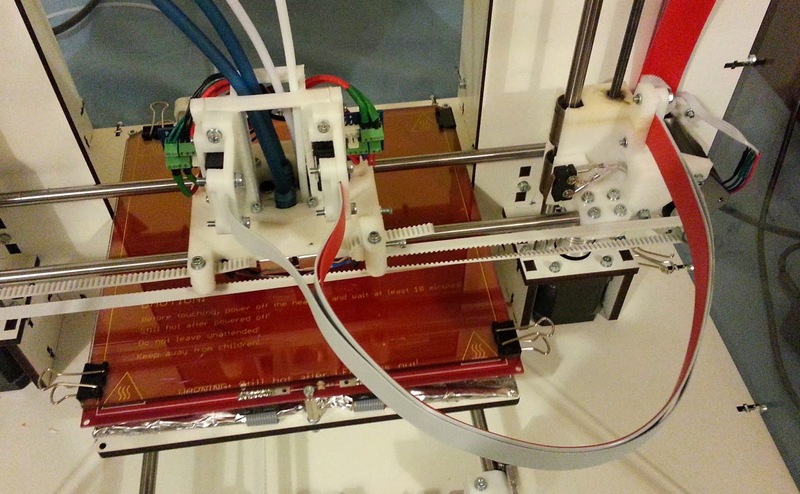 The second ribbon cable follows the same route as the original Mendel90 extruder wiring loom. Ribbon Cable A is the original Mendel90 wiring loom, Ribbon Cable B is a 14 core ribbon cable wired to mirror Ribbon Cable A as shown in the table below. Ribbon A has not changed from my Dual extruder setup and uses the original motor wires to carry the second extruder with the probe circuit carrying the second thermistor. 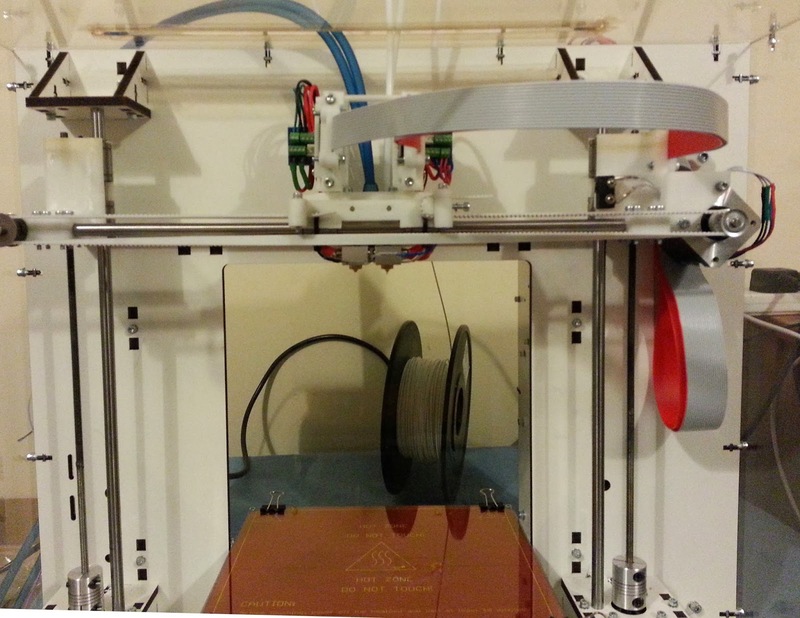 The filament drives fitted are the RepRapPro design for their Mono and Tricolour Mendel. I have extended the RepRap Firmware to accommodate 5 extruders and added one or two legacy commands that other firmwares support. This is definitely still a work in progress to get all the functionality we have become accustomed to with firmware like Marlin. I used fish tank airline silicone tubing because it was easy to get hold of, cheap and flexible. I think any tubing which is flexible enough and fits on the coupling well will do - what will be interesting is the long term effects of the flexing on the tubing. The other end of the tubing has a small pump supplied by E3D and it is just dumped in a water container. 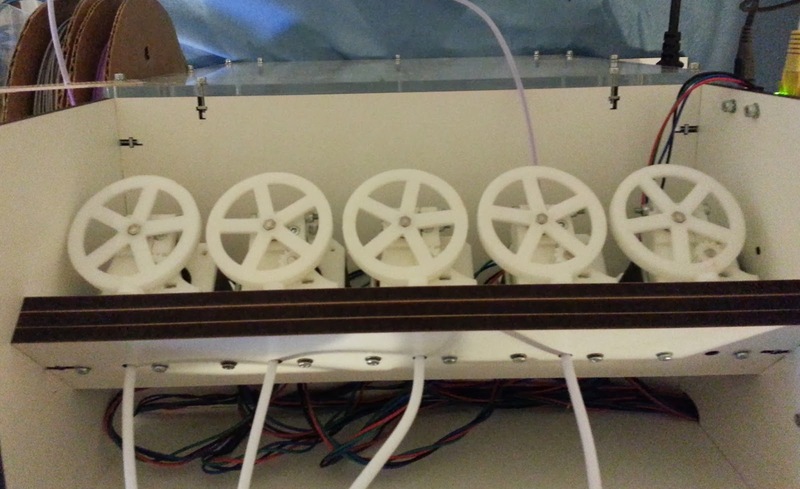 Next I installed the cold block into the x carriage and wired up 4 thermistors and fitted the heater cartridges. I prefer to use axial leaded thermistors (like these) as they are more robust and easy to wire but the heater blocks also have holes for radial leaded thermistors like the EPCOS and tiny ones used in other hotends. I did not fit the Bowden cables yet as it would have been even more unwieldy and the Kraken has a ingenious push fit Bowden connector integrated into the cool block so they can be added later. I then mounted the X carriage and installed two of the bowden tubes. Leveling the bed is extremely important as the "end effector" is now the size of the square made up of the 4 hot end tips. 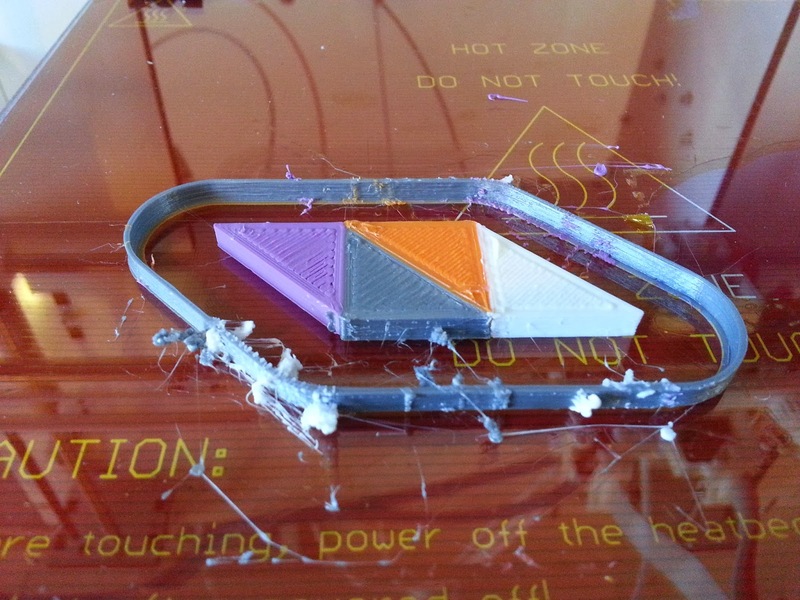 I started with one hotend tip lower than the other three to make the bed levelling easier. its "Bucket O' Octopodes (thicker legs)" model by moleofproduction. 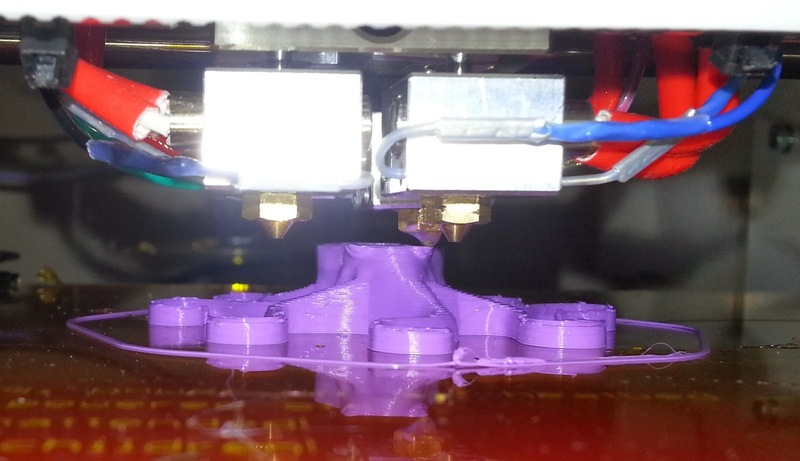 Once I had single extruder printing confirmed I centred the carriage on the bed and lowered it until the lowest tip was just touching (making sure everything is at the same temperature). I then dropped the other tips to the same level (relative to the bed) by loosening the grub screws, securing them in place by re-tightening the grub screws. This was a rather fiddly operation but actually much easier than trying to level four individual extruders. (Well, easier than two so it must be easier than four!). I have uploaded this test piece to thingiverse. 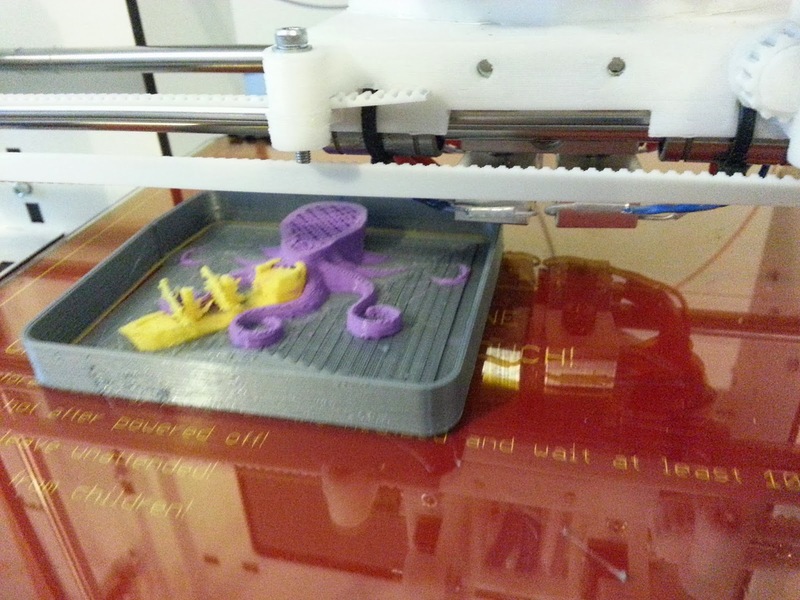 As can be seen Slic3r is building a full- height skirt around it which catches the ooze. That combined with a 20C drop in temperature between the active and standby hotends is reducing the ooze effect. I also cheated in this design as the similar corners of the triangles are 20mm apart, the same spacing as the nozzles. My next idea was to make up a 4 colour "kraken" scene to try something a bit more difficult. 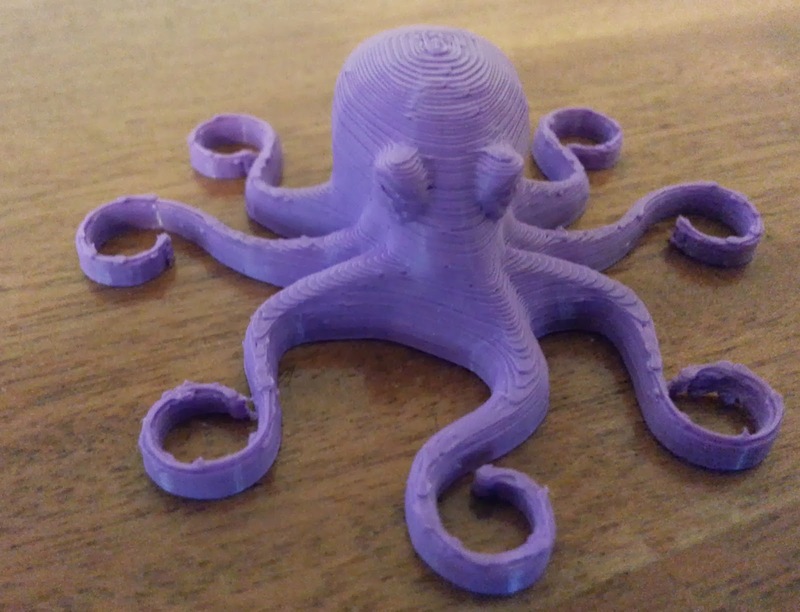 Using OpenSCAD I imported the "Bucket O' Octopodes (thicker legs)" and Daid's "Small OpenSCAD Ship" slightly modified to be easier to print. I cut out the eyes and added some spheres to use another colour and then built up a scene with some "water". Ignore the weird tentacle shaped gap in the head - it's a rendering artifact. Not perfect by any stretch! I think it will a big improvement when I design a fan duct for this setup which should help the thin sails to print better. The ooze wall did not fully catch all the ooze - I think a 30 or 40C change in temperature might be needed but that will take ages for every colour change. I have also found an issue with extrusion in Slic3r when using multiple extruders - it sometime extrudes a huge amount too much which may account for some of the blobby-ness. Update: not an issue with slic3r - I entered 90 rather than 0.9 in the top infil box! Plenty more to improve on but it has been really fun setting this up and working with the Kraken - its a great multi nozzle hotend! You have a setup very close to what I'm doing. Does the ribbon cable handle the current well. Most of the beds and cartridges have 16 gauge wire rated at 22 amps. I was curious if you saw any adverse effects. it works fine on our M90s but we use 26AWG not standard 28 AWG for our wiring looms. 26 AWG over 3 or 4 strands is fine in my experience and there is no noticeable heating effect. I was wondering if it was possible to move all of the extruders to the expansion board by changing the indexes. eg. I'm going to put the expansion board next to the extruders and didn't want to run extruder 0 back to the main board. Would this work? That should work, the index is the position in the array for the step/enable/dir pin and the thermistor and mosfet pins. this is not in alot of places though so should be easy enough to change. I do wonder if this is really necessary, why not use E1 to E4 in you Gcode, rather than E0 to E3? Looks good, but as you say, more like a Medusa with all those wires! 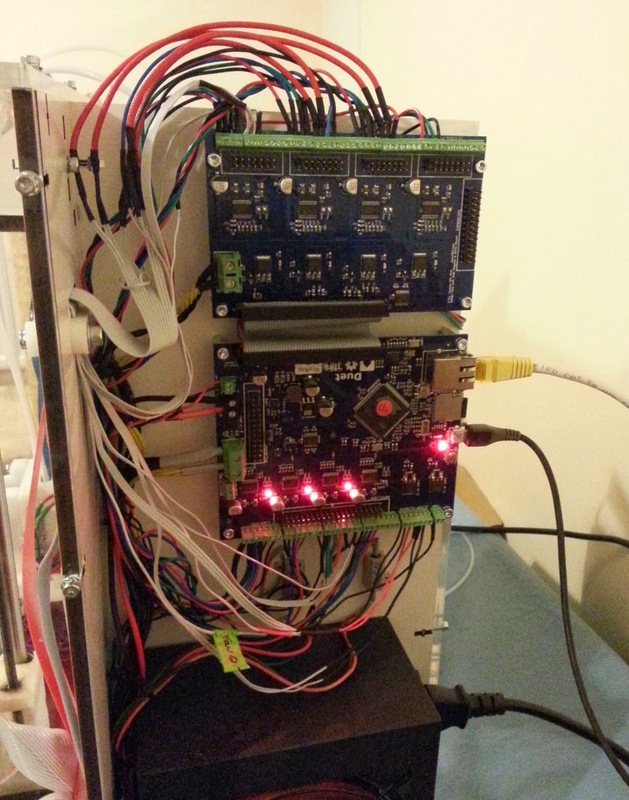 How about moving the temperature measurement and control functions to a board mounted on the hot end? 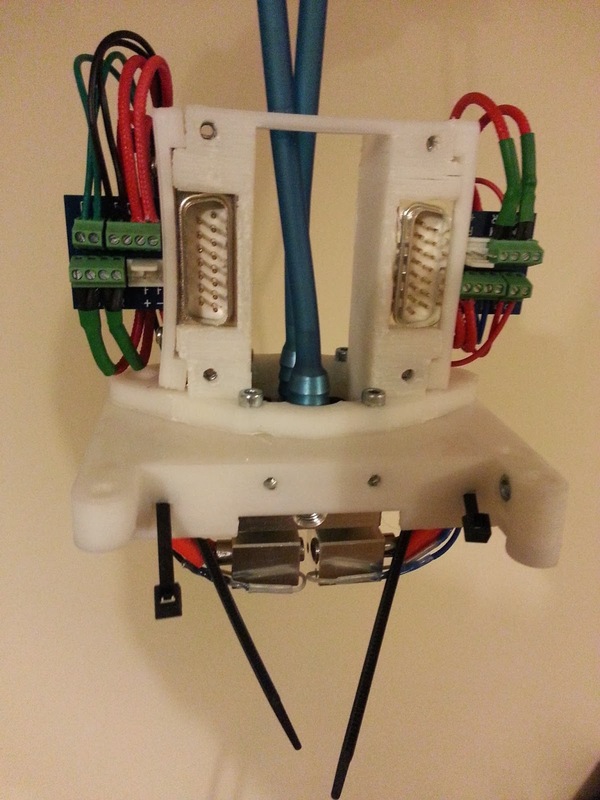 I produce a board that does height sensing and fan control for the Ormerod, and you could use a similar board with a few more connectors to offload the temperature control. Then you would need only 12V power wires for the heaters, and some mcu power and signal (e.g. serial) connections. Total about 6 wires. I am told that the cartridge heaters only need about 50% PWM maximum even when printing ABS, so by running them in out-of-phase pairs you could keep the peak current in the 12V power wires to 8A. As you say it has a lot of wires and I do like your height sensing board. That said the wires are easy to manage using ribbon cables for the wiring loom and significantly cheaper than another PCB. The other advantage is all the hard work to manage the heater and temperature measurement is already done on the Duet, remoting this to a serial interface, while not difficult would be a lot of work in hardware and firmware for (in my opinion) not much gain. Also by doing it this way you can use other electronics and firmware with no changes other than replacing the electronics boards. This is that wath i plan to build .. cool that you share it ... thanks ..
have you print some new multi-color things? I have not been printing much with this printer recently as I have been focusing on the Kossel mini we have just released. All those are printed on the single extruder version of the Mendel90 though. 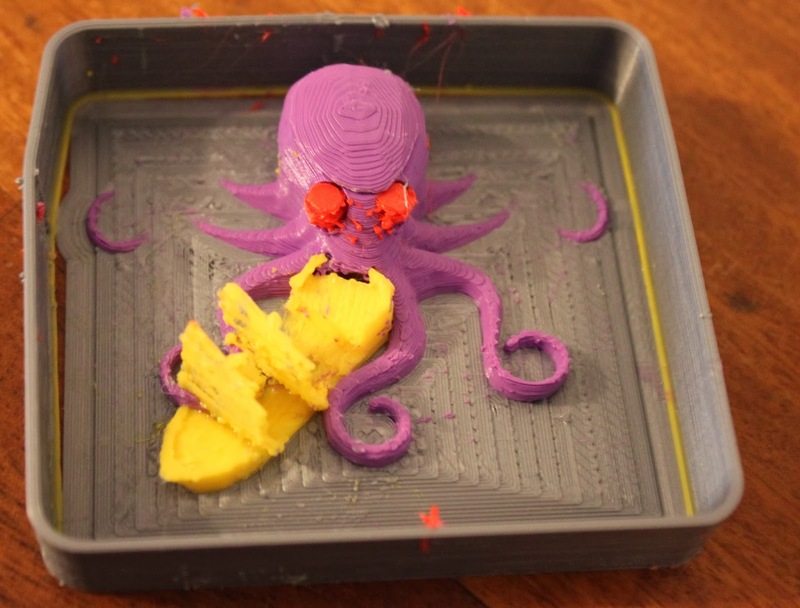 I recommend starting with a single extruder version and then adding the Kraken.